Mar 02, 2016 (LBO) – SriLankan Airlines is poised for a shift in strategy, ranging from privatisation to network restructuring, in a bid to achieve sustained profitability, Ajith Dias, chairman of SriLankan Airlines told the Oxford Business Group. SriLankan Airlines has been faced with an increasingly difficult operating environment as rising competition, tighter margins and lobbying by local vested interests have weighed on the carrier’s performance. In an effort to turn its fortunes around, the airline announced a raft of wide-ranging plans, which include listing key subsidiaries, modifying its route network and improved management of several contingent liabilities. SriLankan Airlines has remained largely unprofitable since the carrier’s ownership structure changed in 2008, when a 10-year management contract with Emirates Airlines was not renewed. The government now owns 99.5 percent of the airline through direct and indirect holdings. According to government statements the national carrier has accumulated 145 billion rupees in operating losses in the seven years since the shift. The airline has come under further financial pressure in recent years, culminating in an aircraft purchase from France’s Airbus in 2009. Under the agreement, the previous government contracted 10 aircraft for delivery between 2014 and 2021, according to local media reports with more than 1 billion US dollars in capital commitments pledged in the near-to-medium term. Ajith Dias, chairman of SriLankan Airlines, described the 2009 purchase as unwarranted. “Our requirement for aircraft with long-haul capacity was not very big, given that our longest flight time is 11 hours to London,” he told OBG. The airline remains in negotiations with Airbus to minimise future damage, which could potentially require the selling off of assets as payments become due. While the Sri Lankan government provides unconditional guarantees on the carrier’s notes and interest – which has earned SriLankan Airlines a Fitch credit rating on par with that of the sovereign, at “B+”, Dias said there was a strong message in the 2016 budget that the airline must work towards becoming more self-sufficient. The government, he warned, was clear that it could not support the carrier indefinitely. SriLankan Airlines recorded a profit for the first time in five years in August and December 2015. While the results were largely attributed to the decline in international oil prices, which represent a substantial portion of operating costs, the carrier will be looking to build on this newfound momentum through further structural adjustments. The Airline nonetheless faces a tough operating environment marked by increasing competition, particularly from Middle Eastern carriers. In a significant move, Dubai-based Emirates Airlines announced plans in January to add an additional daily flight to its Dubai-Colombo route beginning in August. In response to such moves, SriLankan Airlines hadsoughtto extend its regional reach and scale back its long-haul flights. “There will be a sharper focus on India and China, with increasingly frequent flights, and, in India’s case, using smaller planes,” Dias told OBG in December. Earlier this year SriLankan announced plans to do away with its Rome route by mid-year, and signalled its intension to reconsider less profitable European routes, such as those to Paris and Frankfurt. However, this announcement was met with staunch criticism from the country’s tourism lobby, which feared lower arrival numbers from these key source markets. In late February, the airline was forced to reconsider this strategic shift, and opted to retain flights to London, Paris and Frankfurt, with a fifth weekly flight added to the Frankfurt route in July. For its part, the Rome route will still be phased out in May. Expansion efforts are nonetheless continuing, and January saw SriLankan bolster its China offering with three weekly non-stop flights to the city of Guangzou, northwest of Hong Kong. The airline is also looking to acquire two 40-seat aircraft to serve the domestic Sri Lankan market which is considered to have significant growth potential given ongoing challenges with road infrastructure and inland connectivity. At present, Cinnamon Air, owned by Sri Lankan conglomerate John Keells Holdings, runs the only regularised network of domestic flights, with a small fleet of Cessnas. In December the government announced plans to list between 30 percent and 49 percent of its wholly owned catering subsidiary, SriLankan Catering, as well as the airline’s ground handling unit – both of which operate as protected monopolies at Bandaranaike International Airport. The move is expected to improve efficiency and quality of service, while also generating some much-needed liquidity for the carrier. With a 72 percent market share of total seat capacity, SriLankan is well positioned to leverage growth in tourist arrivals. Visitor numbers were up 24.3 percent year-on-year (y-o-y) in January, according to the Sri Lanka Tourism Development Authority (SLTDA), with forecasts suggesting the trend will continue in the coming years. The SLTDA has set a target of 2.5m arrivals in 2016, up from 1.8m in 2015. 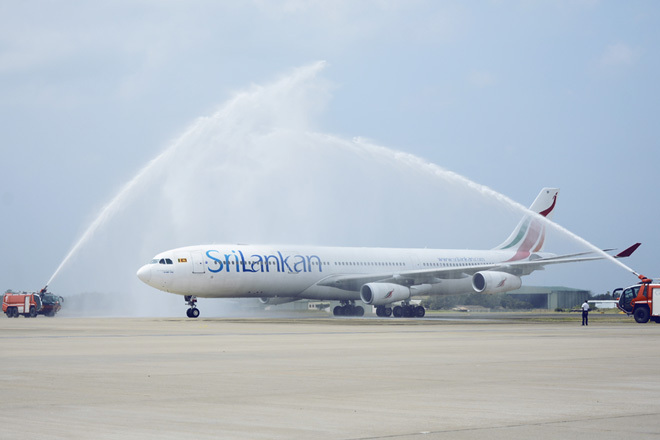 The growth of arrivals from India and China in particular, which increased by 25.9% and 122.3% y-o-y, respectively, suggest SriLankan Airlines’ strategic pivot to East Asia could pay dividends for the carrier.